The story behind the film version of Mary Poppins (1964) is the subject of a clever and charming new film about the clash between the English author Pamela ‘PL’ Travers and famed studio head Walt Disney. 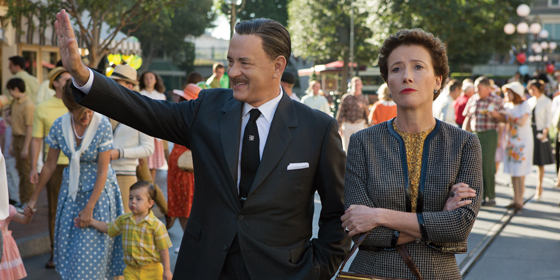 When we first see the elder Travers (Emma Thompson) in 1961 she is running short of money, due to declining book sales, and her agent is urging her to accept the offer of a trip to Los Angeles to meet Walt Disney (Tom Hanks), the mogul who has pursued the rights to the project for 20 years. Having promised his two daughters to turn their favourite book into a movie, he is very keen on the idea of a big budget musical, granting her full creative input into the project, something he rarely did. Unfortunately, he doesn’t realise that Travers actively hates the idea of a musical and resists almost all the suggestions from the creative team at the studio (a trio played by Bradley Whitford, B. J. Novak and Jason Schwartzman). Gradually, through flashback, we discover the reasons for her reluctance may lie in her childhood, when she grew up in Australia with a loving but troubled father (Colin Farrell). On the surface, this may appear like another slickly produced Disney feel-good comedy. Whilst it is certainly all that, the film has its own interesting backstory. The origins of the project lie in a 2002 TV documentary about Travers, which eventually led to Allison Owen coming on board as producer and eventually a script credited to Sue Smith and Kelly Marcel made 2011s ‘Black List’ (an unofficial survey of the years best unproduced scripts). Then, in a strange reverse parallel to the film, the producers had to persuade the notoriously sensitive Disney that they would not trample on Walt’s legacy. Eventually, the Mouse House relented to the first ever depiction of Walt Disney on screen and the finished film is mostly a charming surprise. This is due in large part to Emma Thompson and Tom Hanks, whose constant sparring provides a lot of the comedic sparks. Thompson’s Travers is a perpetually defiant English woman who manages to hide a troubled past, whilst Hanks plays Disney as a loveable, charming uncle who’s drive and ambition are never far from the surface. To an extent, the film glosses over the thornier aspects of each character: there is no mention of Travers’ unconventional personal life or the darker side of Disney. However, this is not entirely a bad thing as a warts-and-all drama would have been out of the question for a mainstream Disney release. But the end result is not just a sanitised product but a rather sly portrait of a spanner in the Hollywood machine. It is in essence an exploration of ‘creative differences’ — that well-worn phrase so beloved of Tinseltown to maintain the idea that idea that raging rows were amicable disagreements. Some of the funniest scenes in Saving Mr. Banks come in the rehearsal room, where Travers is aghast at some of the songs and suggestions that are now so beloved by fans of the 1964 film. These are executed with a light touch that is unfortunately not true of the extended flashback sequences which dwell a bit too clumsily on her childhood. Make no mistake, this is a manipulative film and the hiring of Thomas Newman to score it only adds to its seductive power, with his lush hanging strings and signature instrumentation providing a lightness to the comedy and emotion to the drama. As Walt Disney ultimately persuades P.L. Travers to accept the idea of a movie, we can see what a driven man he was, whilst at the LA premiere we can be moved at the author’s reaction to the film, even if that may not have been exactly as presented here. She told the BBC in 1977 that she had ‘learned to live with the film,’ which is a hardly a ringing endorsement. But then maybe this film, like the musical and the original book, is just another pleasurable fantasy. Is pleasure such a bad thing? One man adrift in the Indian Ocean is the premise for J.C. Chandor’s second film, a compelling tale of survival against the odds. Opening with a brief, mournful monologue of an enigmatic sailor (Robert Redford), we hear a crash and are plunged back a few days to when his boat, the Virgina Jean, collided with a large metal cargo container. We immediately see he is calm under pressure, scooping out water and doing the best he can under the circumstances: patching up the hole and trying to fix the wet radio. Cryptically listed in the credits as ‘Our Man’, perhaps he is a retired businessman who took up sailing. Maybe he is a professional sailor. Who knows? Perhaps he represents any human being caught up in a desperate situation. The point of this film is to put us in there with him as he battles the elements. Chandor and his crew slowly build the tension as we see all manner of obstacles: the leaking boat, storms and sharks. 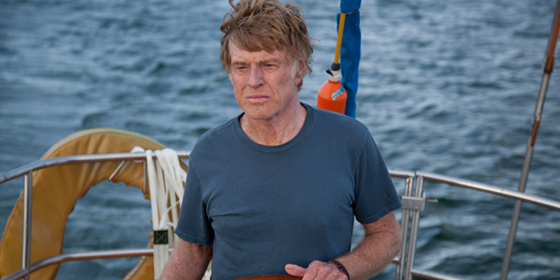 Apart from a few words, it is free of dialogue, meaning there is a relentless focus on Redford and his situation. This is surprisingly riveting, as previously routine acts such as putting up a sail or jumping into a raft become critically important. But Chandor also has a few more tricks up his sleeve, most notably the casting of Redford. The movie star brings a grizzled gravitas to his part in what is his best work in years. Cinematographer Frank G. DeMarco brings an immediacy to the action on the boat, whilst visualising the beauty and danger of the oceanic environment. Cleverly blending in location shooting with work in tanks and visual effects, it paints a hauntingly plausible scenario of what it is to be stuck at sea. The sound design is outstanding and the large sound team, headed by Steve Boeddeker and Richard Hymns, does sterling work in capturing the many different aural textures aboard the boat, life raft and ocean. For writer-director J.C. Chandor this marks another remarkable film after his feature debut, Margin Call (2011). That still remains the best feature about the financial crisis, and seems to be a world away from All is Lost. But look closely and there may be parallel themes: crisis, dread and the aforementioned survival. The building and firm in Margin Call which created their own financial problems could be a cousin to the boat in All is Lost – both are sinking fast. With these two films Chandor has already created powerful parables for our time and the degree of skill and intelligence he applies to his work only makes me hungry for his future work. Based on the true life experiences of a free black man forced into slavery, Steve McQueen’s latest work is a stunning achievement. The kidnapping and enslavement of Solomon Northup (Chiwetel Ejiofor) from 1841 until 1853 form the spine of this harrowing tale. Northup endures a hellish odyssey as he is chained and sailed down to New Orleans, where he encounters the brutal truths of the slave trade. One owner is relatively benevolent (Benedict Cumberbatch) but his psychotic assistant (Paul Dano) forces a sale, meaning Northup eventually ends up picking cotton for the ruthless Edwin Epps (Michael Fassbender). Amongst the other important people he encounters are a slave trader (Paul Giamatti) who renames him ‘Platt’; a fellow slave (Lupita Nyong’o) and a sympathetic Canadian who may be able to help him (Brad Pitt). From the opening scenes until the closing credits, fans of McQueen – and I remain a huge admirer of Hunger (2008) and Shame (2011) – will recognise his mastery of the visual and audio language of cinema. But here, he and his collaborators are painting on a bigger canvas and the result is a stunning historical drama which is likely to be the definitive film on the subject for many years to come. The production design by Adam Stockhausen and use of the Louisiana landscape gives everything we see a remarkable authenticity. This in turn is aided by the superb ensemble cast who chew up John Ridley’s dialogue with relish. 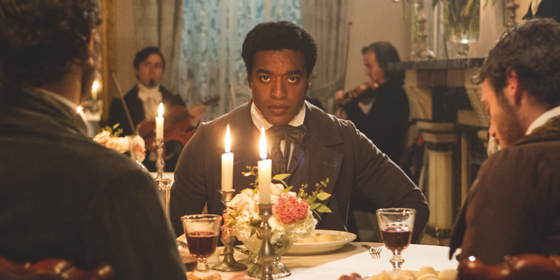 At the centre of all this is an incredible performance from Ejiofor as Solomon Northup. We see him go through many episodes of mental and physical torment whilst maintaining his quiet dignity and hope. It is a moving, subtle and rich performance which shows just what he is capable of with the right material. Cinematographer Sean Bobbit continues his fruitful visual collaboration with McQueen and the beauty of the South is evoked alongside an air of dread and menace. An agonising one-take sequence of a lynching is just one of many scenes that stay with you long after the film is over. The icing on the cake is Hans Zimmer’s haunting score, which at times resembles his orchestral work on Inception (2010) and The Thin Red Line (1998). In addition the use of spiritual songs as the slaves work in the fields, adds another human touch, hinting at the defiance which would later spawn the Civil War and ultimately the Civil Rights movement of the 1960s. There has long been a curious reluctance for mainstream US cinema to examine the dark chapter of slavery. Aside from the stylised world of Django Unchained (2012), realistic films haven’t really been made about the subject. Even this project took a British director and several production companies (River Road, New Regency, Plan B and Film 4) to eventually bring it to the screen. Perhaps the oddest aspect is how this particular story was dormant for so many years. Although it was published around the same time as Harriet Beecher Stowe’s Uncle Tom’s Cabin, the book remained a relative obscurity. 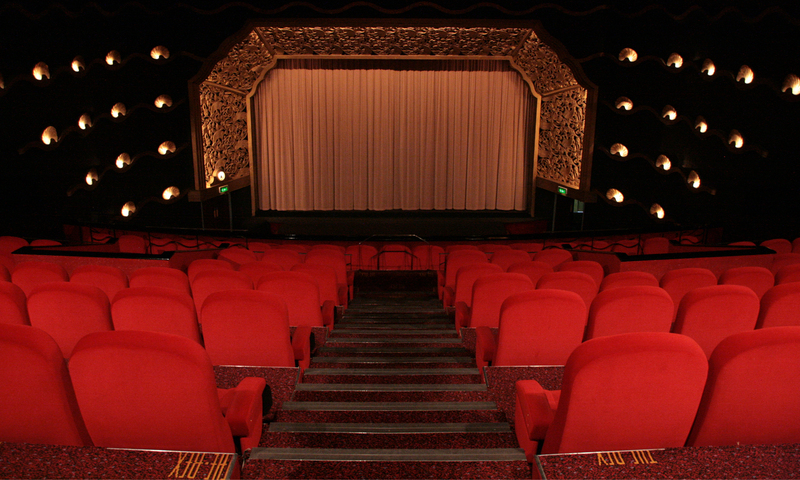 Maybe it was a reluctance to confront the ghosts of the past, or perhaps it just wasn’t good box office. Intolerance still lies beneath the surface of American life, even in the age of a black US president, but this film is a powerful reminder of the cruelties of racism and the endurance of hope. The Coen Brothers are in a more reflective mood for this beautifully crafted drama, set amongst the New York folk scene of the early 1960s. Opening with folk singer Llewyn Davis (Oscar Isaac) performing in a Greenwich Village nightclub in January 1961, we soon discover he is a man struggling against the odds, in both his personal and working life. His record label are useless in paying his meagre royalties, a hectoring ex-girlfriend (Carey Mulligan) tells him she is pregnant (and she’s unsure who the father is), he frequently has to couch surf and also manages to lose a friend’s cat. Despite all of these mishaps he plugs away in search of a bigger break, travelling to Chicago and back again in the winter, trying to convince people to take a chance on his music or a least help him out financially. Wilfully subverting the traditions of the rags to riches music biopic, it focuses on a man whose existence appears to be an ever decreasing circle of fame and money. Imagine if Bob Dylan hadn’t quite made it and you’ll soon get the idea. If this seems like a gloomy tale, don’t forget that the Coens are past masters at mixing light and dark and this is along the lines of A Serious Man (2009) and Barton Fink (1991). Like those movies, it features many funny scenes populated with memorable characters: two friendly academics (Ethan Phillips and Robin Barrett); a sister (Jeanine Serralles); singer and ex-partner Jean (Mulligan) who is now seeing a rival Jim (Justin Timberlake). One of the most striking episodes – which may be related to the film’s title – is a road trip to Chicago where Davis hitches a lift with a silent driver (Garrett Hedlund) and a rotund jazz impresario (John Goodman), on the way to see a promoter (F. Murray Abraham). This sequence, and the film as a whole, bears all the hallmarks of their very best work: immaculately shot by DP Bruno Delbonnel, it also features some stunning production design by Jess Gonchor, who recreates the era in meticulous detail. 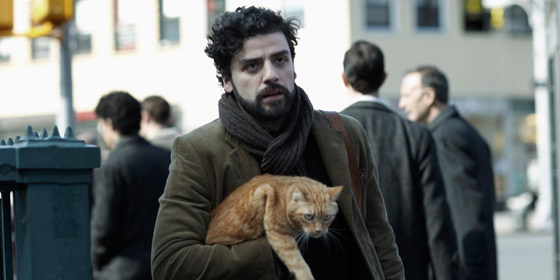 At the centre of all this is an excellent performance by Oscar Isaac, who manages to capture the weary melancholy and outsider attitude of a struggling – and not particularly likeable – artist. As for The Coens, this seems to be another of their more personal films where a Job-like protagonist is constantly struggling within a comically hostile universe. But the aforementioned connection with Bob Dylan is an interesting one: like the legendary folk singer, they moved from Minnesota to New York and a scene near the end is perhaps more than just a tip of the hat to him. As for the soundtrack, the Coens team up once again with executive music producer T Bone Burnett, who memorably collaborated on the O Brother Where Art Thou? (2000) soundtrack, and the result is arguably as good. One of the year’s most impressive films, it is a strong addition to the Coen’s canon and a memorable depiction of a struggling artist.